What is the Intersegmental Traction Table? The IST tables are a way of inducing passive motion into the spine for the purpose of flexing spinal joints, increasing mobility and preventing disc degeneration. The patient lies face up on a bench table which has roller-type cams beneath its surface. These rollers can slowly travel the length of the spine, providing the spinal joints with motion. Most patients find this form of therapy to be relaxing and very helpful. The gentle rolling action is restful, yet flexes and exercises the spine without effort. Since discs have a poor blood supply, they get nutrients from the circulation of fluids surrounding the spinal joints. Fixations prevent this natural circulation and can cause disc thinning and degeneration. The IST tables helps increase and restore nutrition to the discs which is necessary for adequate elasticity and shock absorption of the spine. 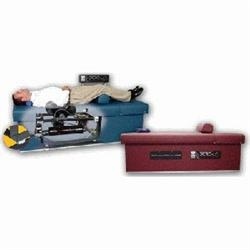 The IST tables induce passive motion into the spine for the purpose of flexing spinal joints, increasing mobility and preventing disc degeneration. The patient lies face up on a bench table which has roller-type cams beneath its surface. These rollers can slowly travel the length of the spine, providing the spinal joints with motion. · Fun, comfortable, and easy to use. The original spinalator was developed in 1938 by Dr. O.N. Donnahue. Dr. Donnahue thought of this idea after observing that relaxation of the tension and mobilization of the patient’s spinal area improved the results of his adjustments or correction of a spinal subluxation. He realized that a mechanical device providing alternate pressure of adjustable intensity could enhance what he was doing by hand. Since 1938 more than 10,000 units have been put in service with continuous improvements yet no change in the primary function. The spinalator’s unique action is provided by three resilient six-inch diameter rollers mounted on a rotating spindle and driven by heavy-duty electric motors. The rollers compress, knead, and massage the patient’s spinal area 24 times per minute. Roller pressure can be applied in a stationary position to treat a six-inch portion of the spine or longitudinally along a 17-inch travel path which automatically reverses every 70 seconds. Roller rotation can be clockwise or counter-clockwise, as desired.